To Help You Create The Layout Of Your Dreams!" You CAN now create your own truly realistic layout that will amaze your friends... within a limited space, within your timeframe, and within budget. The plans in this ebook can help you turn your dreams into reality as you learn step-by-step how to plan your very own well thought-out n scale layout... just like those ones you've admired at model train shows. You’ll find each of these track plans an adventure in itself… just like visiting someone else’s home railroad. And, you can easily adapt any of the plans around your favorite railroad theme. The plans include scenery ideas and a full parts list for each and every track plan in this book… I know you’ll find that handy! The good thing is; you can take any plan in this book and add more industrial spurs and yards if there aren’t already enough. And, if you prefer freight operations, you can pick a plan that has a long mainline with spurs frequently turning off. If your preference is for yard switching, then keep the mainline more simple and choose a plan that allows for more yard tracks. There are plenty of helpful suggestions in the ebook and I know you’ll find plenty of options to choose from. And, most of these plans can easily be modified to exactly what you want. I would imagine (and really hope) that you will adapt any of these plans to suit your individual interests and to fit the space you have available. They are a great starting point on the journey to creating the model railroad layout of your dreams. The track plans, along with all the helpful tips and ideas, come in simple PDF format that is quick and easy to download, so you can have it within 5 minutes… no waiting… no shipping to pay. You can view the information on your computer, burn it to a CD, or print out the pages you need. It’s really quick and easy! 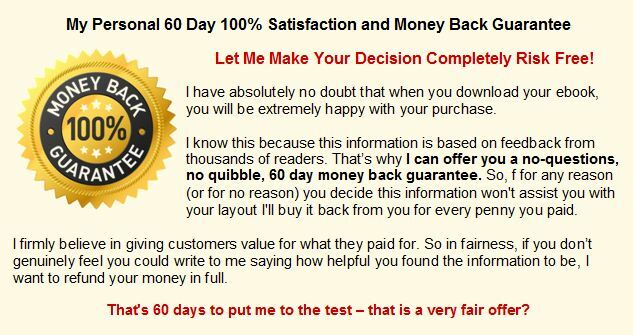 And, it comes with my full no questions asked 60 day money-back guarantee. So, in a matter of minutes you’ll have the right information to plan and build your n scale layout within budget, within your timeline and in the space you have available. This truly valuable resource is a definite “must have” for model train beginners and it will be helpful to any intermediate railroader regardless of which scale you model. Better still, this information is laid-out in a way that is very easy to understand, easy to use…and is even easier to use right away. For just $37 today and you can get instant access to all these n scale track plans and ideas... and be on your way to creating a truly amazing N scale layout! Great value when you consider having a ready-to-go plan could save you hundreds of dollars, or hours of time, which makes investing the $37 a no-brainer. And, when you order now, you'll also qualify for a special bonus offer! So, click the link to order and you’ll have it within 5 minutes! If you are new to product ordering online click on this for more information. This e-book CANNOT be purchased in stores. You can only access it via this N scale website. Many of the track plans found here can be modified and combined together. There is enough variety to satisfy almost any level of modeling self-expression. As with all forms of modeling, and particularly in railroading, it’s all up to the individual! These N scale track plans are examples to give you ideas and save you space. You can replicate them without changes, or hopefully change and adapt them to something that is uniquely your own. Use your creativity and see what you come up with based on the space you have available for your model railroad and the type of operations you like. On most plans I have included a few scenery ideas to get you thinking about what you could add (or change). A few of the track plans run close to the edges of the benchwork, so you might want to add an inch or two if you feel you need extra space. The added edges can then be used for scenery such as bushes, lichen, rocks, or for low relief (inch thick) buildings. The edges could be made from wood, or extruded insulation board. Also keep in mind which country you are modeling as it may influence which side you want to run your trains on (left or right). For that reason you might decide to simply flip some of these plans to suit your planned train operations or room layout. So, really what I am saying is this; there is no shortage of ideas in this "Space Saving N Scale Track Plans" book for you to use and/or adapt. It is YOUR railroad you are creating, so you need to decide on a plan that is right for you, based on what you personally want from your railroad, and based on the space you have available. The important thing is to consider all your options before you finally decide on a plan, because once it is in place it can be difficult to start all over again. That's why there are so many plans with different track configurations packed into this downloadable book. It gives you numerous options and ideas to help you decide what is best for the space you have available before you get started. You are sure to come across several track configurations you might never have considered if you hadn't seen them in this book. The ideal track solution can be at your fingertips, along with a list of the various track parts you'll need for each plan. 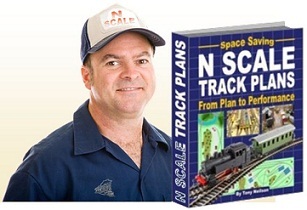 You can download this book within minutes and be well on your way to creating your dream N scale railroad. You mind will be a buzz with the possibilities, options and clever ideas to help get you started. This is a wonderful resource you'll be able to refer to for years to come. The type of operation you are anticipating is a key consideration in deciding on an N scale track plan. It’s common for the beginner to want to get as much track into as little space as possible. Pursuing this option generally leads to a “run trains” kind of operation, that is to say, the whole focus of the layout is to have trains moving through scenery. Layouts that have a lot of loops, figure-eights, and “spaghetti track” satisfy this type of operation nicely. With some clever scenery planning and placement, a small N scale layout with a lot of packed in track can actually look a lot bigger. However, this is something of a compromise. In the real world, railroads only build expensive rights-of-way where it makes sense, and multiple track arrangements are usually only seen on high traffic main lines and in yards. An N scale layout (or any other scale for that matter) with track occupying every available square inch is not very realistic, so here is probably the first opportunity to give some thought to what you want your layout to do. Certainly, moving trains around the layout is an entirely valid method of operation. In fact, some layouts exist just to put track in place to run trains on with very minimal scenery. This is one step above putting the track down on the carpet and taking it up again when finished. Planning scenery for a crowded N scale track plan can be a challenge. There’s just not much room left for the scenery to play a big part in setting the stage for your N scale railroad. When you look at many N scale railroads, the detailing and scenery are typically the main focus. Although there has been little written on the subject of how to fit scenery into a dense track layout, one of the most common approaches is to model an urban setting. Such a setting, particularly if modeling a passenger station or yard, looks more prototypical with many tracks. Although rural scenes rarely have more than two tracks in view at a time, mid-layout view blocks can go a long way toward lending the impression of trains leaving the area for someplace else, then arriving from a totally different direction a short time later. Dense track layouts are also good candidates for multiple train operation on the same line. The number of turnouts and alternate routes can also make an interesting challenge to keep all the trains running smoothly as they meet and pass. The other end of the spectrum of layout function is the classification yard. Railroads use classification yards to make up trains for dispatch and to break down incoming trains for re-routing or local unloading. There are many layouts whose owners have regular operating sessions in which several operators come together for up to several hours to operate the layout as though it was a real railroad. Cars are switched from destination to destination, incoming trains are broken up and the cars shifted around by switching locomotives just as they are in a real classification yard. These operations can be extremely sophisticated and often operate with compressed time clocks, car manifests, prototypical rule operation, signaling, and dispatching with hand held radios to communicate between the operators. Operation sessions often represent a normal day of some specified prototypical railroad and will use that flag’s procedures, rules, and switching indications. The point of the operation is to have the team operate the line efficiently and with no incidents or accidents that impact a smoothly flowing stream of coming and going trains. There is relatively little of scenic interest in a large yard, although having strategically placed low relief buildings against the backdrop can add dimension and interest to the scene. One of the prototype design features is to keep as much visibility of the rolling stock as possible for safety and efficiency. Buildings are small, typically used to house any tools that might be necessary for an operation. Yards (except for the hump yard) tend to be flat so that the switched cars roll only when necessary and there’s limited need for a brakeman to climb the car and set the manual brakes. One item that is quite interesting in a yard situation is the roundhouse, where locomotives are repaired and serviced. The roundhouse frequently has an associated turntable to position the incoming and outgoing locomotives appropriately. The reason for mentioning the numerous alternatives is to demonstrate how much thought has gone into designs the various N scale track plans featured in this easily downloaded book. It is packed with ideas for almost any scenario imagined. You can use or adapt any of the model railroad track plans in this book. They are great for reference and will stimulate ideas for different and functional track configurations. Some of these N Scale plans will fit nicely on a small 3ft x 2ft baseboards; others are designed for a 4ft x 2ft baseboard; there are several plans designed to fit together in modules; others track layouts are suited for around the wall shelf layouts; and others are intended for much bigger spaces. This e-book has N scale model railroad track plans for almost every situation and space requirement… so you won’t be short of ideas. So download your copy now and you'll have it within minutes.